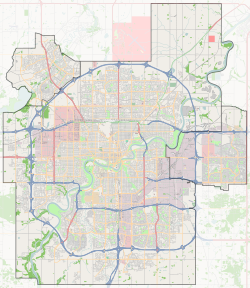 For the north central neighbourhood of Parkdale, see Parkdale, Edmonton. For the west end neighbourhood of Parkview, see Parkview, Edmonton. Residents have good access to the University of Alberta main campus by travelling north along 113 Street. Travel north along 109 Street takes residents into the Old Strathcona area, and beyond into the downtown core. A short distance south of the neighbourhood is Southgate Centre. There is one school in the neighbourhood, Parkallen School. Also located in the neighbourhood is Violet Archer Park. ^ a b c "2016 Municipal Census Results" (PDF). City of Edmonton. Retrieved September 12, 2018. ^ "Contact Info". Parkallen Community League. Retrieved October 13, 2017. ^ Includes triplexes and quadruplexes. ^ North of 71 Avenue, 113 Street turns into 114 Street. This page was last edited on 12 September 2018, at 21:43 (UTC).